I was happily doing something in one room (I think I was making coffee) when I hear a rather disturbing crash from another. What do I find when I reach the room? The Roland, the mixer, a computer monitor and assorted cables laying in a tangled heap on the floor 😐 The way I’ve got the two tier stand set up is RS-9 on the lower, then a solid mount with a computer monitor at eye level – it saves me from having to turn my head to see what’s goin’ on. It’s amazing what can happen when you stick in an insurance claim, ooh they (useless Allied Express) suddenly find the Roland RS-9 and get around to delivering it so I’m a happy chappy now. . . So now it finds itself in it’s new home/ spot in the room along side the Moog Little Phatty Stage II, the Alesis QS6, The Korg T2EX and the Behringer UMX61 Midi Controller 😉 shweeeeeeeet. . Finally got the Moog Little Phatty Stage II, so this pic shows all the toys except the Korg T2EX and the Behringer UMX61 isn’t fully in picture. 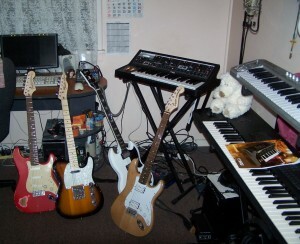 From left to right, Strat Relic Repro, Tobacco Sunburst Tele, ’61 Re-Issue SG, the rebuilt 2002 Squier Strat with HH’s, Moog Little Phatty Stage II, Korg T2EX with the Behringer UMX61 above it. Below the Moog stand is the LX1 Behringer Effects Pedal and on the desk is the Behringer Xenyx 1002FX Mixer. What’s not shown is the JVC KB-700 vintage keyboard/synth, the Yamaha DX27 synth, the Ashton UMK49 midi controller, the Asturcon Metal Master bass and the Ibanez RG.